There are many different opinions in these circles on what the ideal directivity profile in a home loudspeaker should be (and the extent to which it is even important in the first place). Although I don't even hope to begin a thread that settles this discussion, it did get me thinking about the polar responses of real acoustic events (e.g. instruments, the voice) and their relevance (if any) to the polar response of the speakers on which they are reproduced. It seems to me that there must be something relevant to be learnt here. Can and should the question of a speaker's ideal directivity be informed by understandings of the directivity profiles of the real acoustic events it (often) seeks to reproduce? And have good measurements ever been posted/published of polar responses for typical musical instruments (including the human voice)? Without having taken any measurements of musical instruments, voices, etc. myself, I can only speculate on what the polar responses might be, and I'd expect that the range of different polar responses would be very large: think of the difference between a snare being hit - sound shooting off almost uniformly in every direction (other than downwards) - and compare that to what I imagine would be the very controlled directivity sound coming out of a trumpet (at least above a certain frequency determined by the width of its bell). Other instruments may be even more complex. Indeed, it would be very unlikely that the polar response profile of a speaker could ever resemble that of all the sounds on most recordings. But is there nevertheless anything we can learn as speaker designers from thinking about these questions? I don't think there is much to be learned from instruments radiation patterns because all that is being 'screwed up' by the recording process in between. You would have to take into account the pick up pattern of the microphones used, their distance from the sound source, the recording space with its acoustic properties and possible use of artificial reverb. This question is at the crux of the directivity battles and in my opinion, the reason there is no agreement. Different instruments exhibit different polar patterns and will be more accurately reproduced by speakers that exhibit similar patterns. Since no speaker can match every instrument's polar response, you end up having to choose - monopole, dipole, omni, high directivity - each of which sound great when their pattern matches that of the instrument it is reproducing. Apart from a polar pattern match, there is a sonic signature to each of the above patterns that some may prefer over others. I have noticed recently that small dome tweeters (19-22mm) sound different to me than larger domes (27-29mm). There is more air and spaciousness, which I assume is at least partially due to the wider dispersion of the smaller dome. I prefer this on most tracks, but on some tracks it is distracting and would probably prefer a more controlled directivity. On some tracks, in some rooms, I prefer the sound of my waveguide loaded domes, or sometimes the dipoles. At the end of the day, I think most people prefer their seaker to simulate the radiation pattern of the instrument being reproduced. When that can't happen, it's just a matter of which pattern you prefer the sound of. And that's the beauty of DIY. You can make speakers that, more often than other speakers, cater to your room, music collection and listening preferences. 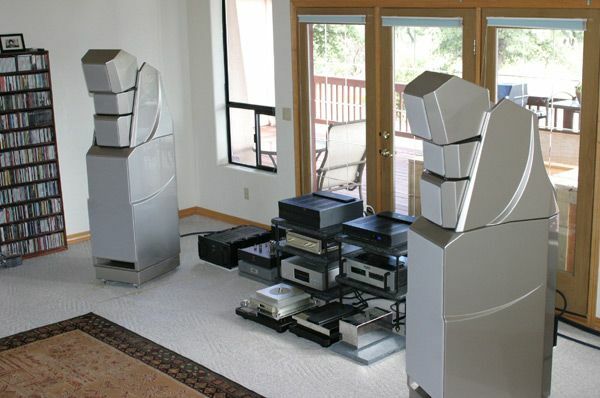 What comes to polar response and types of it - it is good that we have options for different rooms and "tastes of sound" I have dipoels in my living room and waveguide-coaxials in a mancave. Thed do sound diferent but suit the tasks this way very well. Some people think that this is a beautiful speaker, but not me! Yeh, I think this is a valid perspective. Definitely, these factors all contribute significantly to "screwing up" (for better or worse) the original acoustic event. Although I think for close mic'd recordings with minimal or no artificial reverb, most of these factors might end up playing a more secondary role. Some designers advocate constant-directivity designs, while others advocate designs that provide a kind of controlled directivity that gives a downward sloping polar response (i.e. where directivity increases with frequency). Do we have examples of real-world instruments (including the human voice) with polar patterns corresponding to either of these two design goals? Last edited by andreasmaaan; 3rd October 2017 at 02:05 PM. ^This is actually irrelevant, because the recordings are made to be reproduced with typical monopole loudspeakers. Speaking of this, and ugly speakers, the latest Wilson's add a rear facing mid (maybe a tweeter too). Rear-facing drivers have been used to juice the delayed arrivals for a while. Besides Bose, of course, I know Snell did this, to good effect. But "effect" it most certainly is. As Charles points out, the recording process already had direct and reflected information recorded in 2-channel format. Anything we do like reflecting, or multi-speaker DSP, is an effect, not "more accurate" reproduction. Make yourself happy. If you close mic an instrument its radiation pattern is completely irrelevant though, it only plays a role when using ambient/distant mic techniques. Also bear in mind the abilities and limitations of stereo. At its best stereo can give you a window into the recording venue* but it will never be able to turn ones living room into a concert hall. For that you need dummy head recordings and headphones. *by this I mean the optimum result sounds as if your room has an open window to the venue in between your speakers. It will still sound like you are in your room.